Over the last few years I have used this routine to start scores of shows. It's a great little opening routine that allows you to get a feel for the audience and lets them get to know you. Isn't it amazing what you can do with a two minute pack of lies? You can place this at the beginning of almost any rope routine that starts with a single rope. I use it as a lead in to the cut and restored rope. It makes a good routine longer and stronger. You won't have to learn anything new except Kevin Justice's "No Tie Knot" which is in this issue and that should take you all of fifteen minutes. Everything else is pretty much standard stuff put to amusing patter. "Good evening, ladies and gentlemen. My name is Steve Beam." (Use your own name here.) Since we are going to be spending the next fourty minutes together, I thought I would tell you a little about my life and my magic career. First of all, I was born." New reach for the end of the rope hanging out of your shirt behind your tie. Slcwly renove it from your abdomen. You want it to appear as an umbilical cord. Pull it slcwly so that they'll have time to catch on. I also learned how to get the ends tangled and form a knot." Pull the ends through as in the regular knot flourish. Stretch the ends out to display a knot in the middle of the rope. "But, unlike all of the other kids, I was twenty years old and I could make the knot disappear." New you're going to sucker the audience. Grasp the knot with your left hand from the audience's side. This will cover the knot from their view. With your right hand, reach up under the left hand and pretend to take the knot and slide it down the right hand under cover of the right fingers. Actually, the knot remains intact under your left hand. When your right hand clears the end of the rope, pretend to grind the knot into nothing. Make this appear as magical as possible. Stand there as if you have just finished the Merican version of the East Indian Rope Trick. "But usually at this point, all of the other kids wanted to see my left hand, which I would show them. You are still going to sucker them. 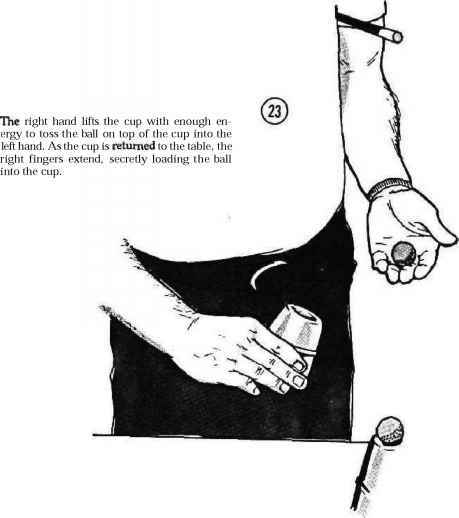 Cup your right fingers away from the audience. Place the knot into your right hand which hides it from their view. Now display your empty left hand. The audience of course knows what's going on. "At this point, the other kids wanted to see both hands which looked someting like this." As soon as you say "both hands," tuck the knot under your chin. Keep it covered as if you don't want anyone to catch on to what you are doing. Keep your head tilted downward to hold the knot in place as you finish the sentence. Garble your words a little because you are holding the rope with seme of the muscles you would normally use to talk. As you display your enpty hands and talk in a funny manner, you will look ridiculous. The audience should be laughing at your predicament. "Magic wasn't ny only interest. In high school I took up archery (perform the "William Ttell Knot") but later realized that it was (k)not for me." Point to the new knot as you say the last part of the sentence.